"A fast pace, a smart heroine, and fresh voice. Julie Kramer has what it takes to keep readers turning pages." In this page-turning sequel to the national bestseller Stalking Susan, TV reporter Riley Spartz pursues a curious story of a bride left at the altar and finds herself caught in a dangerous missing-person case. When Riley Spartz sees a want ad reading "Wedding Dress for Sale: Never Worn," her news instincts tell her the backstory might make an intriguing television sweeps piece. The groom, Mark, last seen at the rehearsal dinner, never showed up for the wedding, humiliating his bride, Madelineand her high-strung, high-society motherin front of 300 guests. His own mother, eager to spare him further embarrassment, waited weeks before filing a missing-person report, and then learned how difficult it is to get police, or the media, interested in missing men. Now Riley is up against a boss who thinks finding a famed missing fish will net the station higher ratings, a meth cartel trying to assassinate a K-9 dog because of his powerful nose for drugs, and a neighbor who holds perpetual garage sales that attract traffic at odd hours. When her missing-person ca se leads to a murder investigation, Riley discovers a startling motive for Mark's disappearanceand a TV exclusive guaranteed to win the ratings... if she lives to report it. For a signed, personalized and shipped copy, contact Once Upon A Crime. "Smart dialogue and a fleet pace make this second outing in Kramer's fledgling series (after 2008's Stalking Susan) a crowd-pleaser." "...slick sequel to 2008's Stalking Susan...fun mystery thriller." "The real draw continues to be the backstage view of the TV-news business offered by producer Kramer, who nails everything from the interaction between on-air talent and producers to all the showbiz hustle that goes into grabbing ratings... nicely done... a likable heroine in an intriguing profession." "Issues of class, complications of a rare medical condition, and elements of romance add to the interest of this sequel, which has a surprising final twist and a neatly satisfying ending. Kramer has a winning series here." "...the twists and turns keep the adrenalin racing." 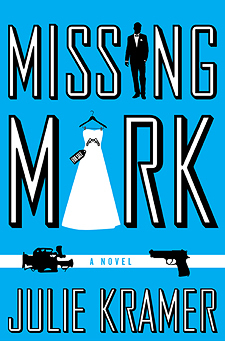 "If you enjoy Sue Grafton's alphabet series with Kinsey Millhone, or Patricia Cornwell's Kay Scarpetta books, you will enjoy Missing Mark. Circle back and read Stalking Susan if you haven't already. Then you'll be all set for No. 3." "Kramer continues her Riley Spartz series with another entertaining and intriguing novel. The author's background in TV news allows her to give an inside look at this cut-throat business through the eyes of a very likable protagonist. Kramer's characters, plotting and pace are spot-on in this excellent follow-up to her awarding-winning first novel in the series, Stalking Susan." "Kramer fills Missing Mark with wonderful characters and a story that never quits. A new star in the mystery skies, Kramer will be one to watch as she gets better with each book." "I love this series. I love the inside look at the workings of a television station. You hear a lot about sweeps, but with Kramer, we get to live with them. The sense of place is wonderful, and Riley is a person it is easy to "root" for. It's easy to see why this author received first mystery award nominations." "Julie Kramer has proven that she has what it takes...Her heroine is fun, spunky, and completely loveable." "Kramer has written a very enjoyable mystery... Riley is an interesting character, a woman I think I'd like to know... I am looking forward to reading more about Riley and her adventures." "If you liked Jon Hassler's take on central Minnesota in "Staggerford"; if you liked Thomas Gifford's take on Taylor's Falls in "The Wind Chill Factor," if you liked Mary Logue's picture of river rats along the St. Croix, you'll enjoy Kramer's informed look into the nuts and bolts and screw-ups of our news media." "Particularly interesting is the author's use of a rare physical condition as the key to unraveling the puzzle and piecing together the clues... Julie Kramer has been successful again in devising interesting and unusual sub-plots and characters to keep the reader guessing and the story moving."